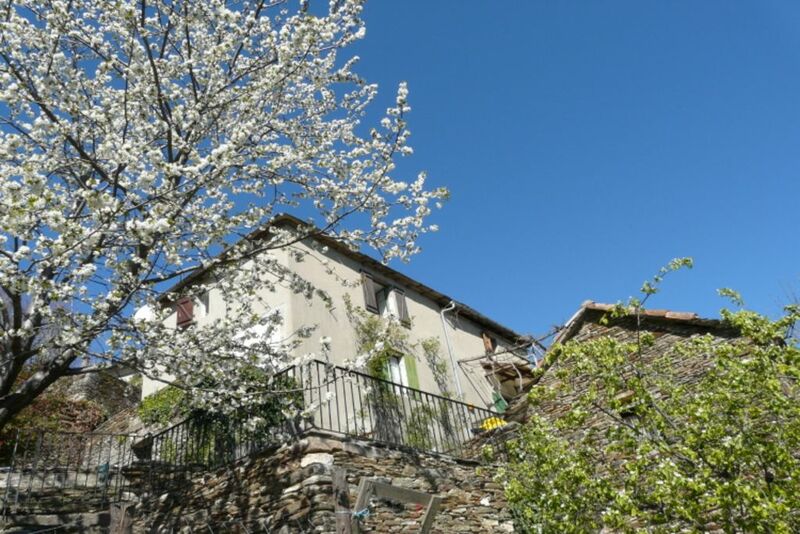 Le Vieux Mas is a 200 year old sympathetically modernised farmhouse in the lovely Cévennes National Park. Combining character and comfort, it has exposed chestnut beams, a wood-burning stove, and country and antique furniture. Yet it also has a fully-equipped modern kitchen (including dishwasher and microwave), comfortable modern beds, satellite TV, internet and wi fi. There is plenty of space, with larger than average rooms throughout. With two large double bedrooms, one standard double and one twin, the house is organised in such a way that couples on their own, families and groups of friends can all immediately feel comfortable and at home. It can readily accommodate more than 6 people, depending on the nature of the group. Two terraces have wonderful views. The Cévennes, is a beautiful but still little known part of southern France. Lying west of Provence and north of the Mediterranean, it is a land of chestnut groves, clear streams, mountain ridges and valleys nestling between the Massif Central and the Mediterranean garrigues. The local rivers provide wonderful swimming but the Mediterranean beaches are just an hour and a half away. The area has an extraordinary history, recounted by Robert Louis Stevenson in his 'Travels with a donkey in the Cévennes', and there are fascinating villages, fine walks and lovely countryside all around. Pont du Gard, Avignon and the Roman towns of the plain are all within an easy drive. Much more on my website, link at the very bottom of this page. Le Vieux Mas is our home in France and visitors will find everything they need there. Well furnished, it has a choice mix of fine antique and comfortable modern furniture. Well equipped, it has everything needed for simple and more elaborate cooking, and for both barbecues and more elegant dining. The upper terrace offers sunny breakfast eating and shaded evening meals, with the most wonderful views. A larger lower terrace has teak furniture, well-suited to barbecues and larger gatherings. There is a mass of well-presented information at the house, maps, guides and our own extensive notes to help visitors to the area enjoy it as we do. For all our visitors, our aim is that it should immediately feel welcoming and to be a home from home, as it is for us. The house is in a tiny rural hamlet, of fewer than half a dozen houses. It is set on a hillside in about an acre of garden and meadow. It is at the end of a tiny lane, so there is no passing traffic and no artificial light at night, and it is almost totally quiet. The garden and meadows are full of birdsong and provide a tranquil retreat. Le Vieux Mas is about 10 minutes up a winding road from Le Collet de Dèze, a village on the N106 half way between Alès and Florac. Collet de Dèze is a busy village, with a post office, a couple of bars and restaurants, a baker, a small supermarket and other shops. Alès (about 40 minutes away) has banks, hyper-markets and all the facilities of a busy town. The Cévennes is an area of great natural beauty lying about fifty miles north of the Mediterranean. Le Vieux Mas is in the heart of the historic 'Cévennes des Cévennes' of the Camisards, with its beautiful chestnut-wooded ridges and valleys, delightful clear rivers, and attractive old farmsteads and villages built from the local stone. The wider local area has a great variety of natural landscape: from the wild flower covered high 'causses', cut by deep valleys and gorges, to the vineyard-covered garrigue; from the bare granite of Mount Lozère to the soft limestone of the southern Cévennes. The area is ideal for a rural holiday, with unspoilt towns and villages and a wide range of outdoor activities available. The Cévennes can be at its best in spring; it is well known for its profusion of rare and beautiful wild flowers. Summer is long and sunny, and the area is particularly attractive in the autumn, when the chestnut trees start to colour, and the light is clear and strong. The area is popular for outdoor activities such as walking, cycling, horse-riding and canoeing, for which equipment can easily be hired. There are also caves and prehistoric sites to explore. There are many fine walks, rivers and lakes for swimming and a variety of restaurants, many with very reasonable prices. The area has an extraordinary history, and there are excellent local museums. For a contrast, it is also close to some of France's most interesting and historic sites and towns, and the coast: Pont du Gard, Arles, Avignon, Nîmes, Montpellier, the Mediterranean beaches and the Camargue are all less than 2 hours drive away. We've owned Le Vieux Mas for over 25 years now, and love returning there throughout the year. In the spring and autumn we walk and enjoy nature, in winter we sit by the warm log fire. And in summer we swim and laze about the house. Now we are retired, we spend more time there so the house is mainly available only in the high summer season, though we do let it at other times too. Our other home is in Edinburgh where we do rather opposite things to what we do in the Cévennes - opera, theatre, galleries; taking full advantage of the city when we are here. As for others, all those years ago, our purchase of Le Vieux Mas was prompted by the new prospect of the channel tunnel. But we were clear that we wanted the sun, not a weekend ruin in the Pas de Calais, and that meant the south, though not the villas of the Mediterranean coast. We like wilder and less well-known places and the Cévennes seemed a good place to start looking. Within a few days we were hooked and - with great good luck - had found Le Vieux Mas - which I made the first offer to buy from the phone box on our camp site. Le Vieux Mas is an authentic Cevenol property with a heavy slate roof, chestnut beams, a wood-burning stove and even little chimneys in the corners of rooms which were used for silk rearing in the 19th century. We loved from the outset - as do all our visitors - the magnificent view from the terrace across the valley, and the ever changing light. We have also come to know better the extraordinary history and culture of this wonderful area, in many ways little changed from when Robert Louis Stevenson explored it in 'Travels with a Donkey'. All bedrooms have fixed electric heating - not needed except in winter. You can provide your own linen or rent it at £10 per person per week. The washing machine and dryer are in one of the cellars, accessible from the lower terrace. The sitting room has a wonderful wood-burning stove. Though it is only needed out of season of course. Parking is about 10m from the front door, in our own driveway. Broadband internet is free (subject to fair use) and is provided by a high-speed satellite link. The living room has a flat screen TV, all free-to-air satellite TV channels (via freesat), computer, broadband, stereo (including iPod docking) and DVD player. There is a good rotating stock of basics including a good range of herbs and spices. The kitchen was completely rebuilt a few years ago and is now a good space for those who like to cook (and entirely functional for those who don't). The dining area inside the house is a good size and is right next to the kitchen area. The country antique dining table seats 6 in comfort and 8 at a squeeze. There are also tables on each terrace. The HDTV is also connected to speakers for hi fi sound. Service is Freesat, which has all free-to-air channels. Similar box for French channels by satellite. All the electronic equipment, including an iPod dock can be played through a good amplifier and speakers. There is a large collection of books, to be found in most rooms of the house. Mainly modern and classic fiction, but lots of maps and guide books too. There is a full-sized table football table on the upper landing and a good table tennis table on the lower terrace. There is a good collection of classical and pop CDs transferred to an electronic 'Juke box' with over 1,000 album titles. There is a collection of toys for mainly younger children. There is a small library of mostly kids' DVDs, just a few more adult titles. Lovely garden close to the house with roses and Mediterranean shrubs and flowers. Also large terraced meadows to explore. There is a wonderful terrace immediately adjoining the dining area which is great for breakfast and lunch. A larger lower terrace also has great views and is more suited to barbecues, larger gatherings and so on. It has a large teak table and chairs to seat six - and sometimes more (there are lots of white plastic outdoor chairs). Nous avons passé un super séjour pour le nouvel an. La maison est spacieuse et très bien équipée. Le propriétaire très sympathique et réactif! Le seul bémol prévoir des provisions pour le séjour car la maison est un peu éloignée de tous commerces . Thank you for this nice review. I'm glad you enjoyed your New Year stay at Le Vieux Mas. The house feels very rural but it's only 12 minutes from a busy village with all services. le mas (très bien équipé) est très agréable avec une vue superbe; vacances très reposantes. Thank you, I am glad you had a great holiday. It is a great view, isn't it. Part of the reason we bought the house 25 years ago and we never tire of it. Tout est agréable dans cette charmante location de vacances. La vue de la terrasse est superbe. La maison est parfaitement équipée. Félicitations pour le matériel de cuisine très complet. Si vous êtes anglophone vous vous régalerez avec le maximum de documentations sur les oiseaux, les randonnées et tout ce qui se trouve dans la région. Le propriétaire est très correct et la transaction s'est parfaitement déroulée. Nous avons passé un très bon séjours chez Alan. Le gite est rustique mais superbe, la vue est à couper le souffle... Tous est très confort et bien équipé. l'échange avec Alan est très agréable, il n'a pas hésité a répondre au préalable par mail à chaque question que nous nous posions. Je recommande fortement cette location dans laquelle nous avons passé de superbes vacances! Le Vieux Mas in a tiny rural hamlet in the the Cévennes National Park, a UNESCO World Heritage site. It's near a busy village (12 minutes) and readily accessible, with good road, air and rail links. The nearest large town, Alès, has busy markets, large supermarkets and all other facilities. It is a great holiday retreat, with a fascinating cultural heritage, perfect for enjoying nature, walking, wild swimming and many other outdoor activities.